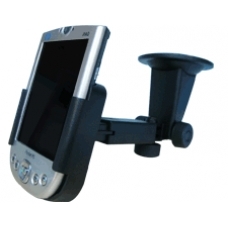 iPAQ car holder Executive Tower mount makes using your iPAQ as a satellite navigation, or GPS device so much easier. These iPAQ car mounts are elegant and vibration free, constructed in Germany from high quality materials. Featuring a screw tightened swivel head and extendible arms your PDA device is held comfortably and securely. The strong hold suction mount means your iPAQ unit can be held on the dashboard or windscreen, making this an ideal iPAQ travel accessory especially in conjunction with a GPS receiver. iPAQ shown for illustration purpose only and is not included. We are confident in the high build quality of our iPAQ car holder, the car holder comes with a 12 month guarantee. * Precision German Build Quality. * Extremely Strong Suction Mount. * Patented iPAQ Model Specific Design. * Screw Tighten 360 Degree Rotating Swivel Mount for Easy Positioning. * Extendible Arm for Easy Reach.